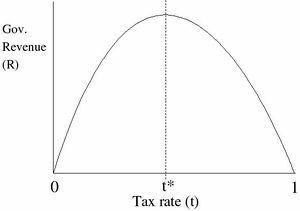 The Laffer curve is a graphical representation of tax revenue as a function of the tax rate. It is named after Arthur Laffer, an influential economist behind the tax cuts of President Ronald Reagan. The Laffer curve is generally a theoretical exercise in the effects of taxation either on the populace or upon the expected yield of tax receipts. The related concept of Hauser's law attempts to average data over a decades-long period and determine the maximum number. The Laffer curve shows that tax revenue is zero when the tax rate is zero percent, but that tax revenue also falls to zero when the tax rate reaches 100 percent, as people increasingly shift to nontaxable income, tax shelters, tax evasion, and leisure. At some tax rate between zero and 100 percent, the government collects maximum tax revenue. For a government that seeks to maximize tax revenue, this is the optimum tax rate. When the tax rate is below the optimum, the government can increase tax revenue by increasing the tax rate; but when the tax rate is above the optimum, the government can increase tax revenue only by decreasing the tax rate. This is a specific application of the general economic principle of changing marginal rates of substitution, in this case, of the substitution for alternatives to earning taxable income. Few economists dispute the general principle of the Laffer curve, although the optimum tax rate itself is a matter of controversy. In the Reagan era, tax cuts led to a near doubling of federal tax receipts ($500 billion to $900 billion), an effect attributed to the Laffer curve. However, some dispute this, claiming that the increased revenue can be at least partly attributed to a policy of deficit spending. ↑ Supply Tax Cuts and the Truth About the Reagan Economic Record, by William A. Niskanen and Stephen Moore, Cato Policy Analysis No. 261 October 22, 1996. Taxation: What’s the Ideal Point on the Laffer Curve? This page was last modified on 26 September 2018, at 13:02. This page has been accessed 20,651 times.